A traveling exhibition from the Smithsonian National Museum, Changing America: The Emancipation Proclamation, 1863, and the March on Washington, 1963, will open at the Harriet Cheney Cowles Memorial Library at Whitworth University, Spokane, Wash., on April 6. The exhibition will examine the relationship between two great people's movements that resulted in the Emancipation Proclamation, in 1863, and the March on Washington, in 1963. Both grew out of decades of bold actions, resistance, organization, and vision. One hundred years separate them, yet they are linked in a larger story of liberty and the American experience – one that has had a profound impact on the generations that followed. 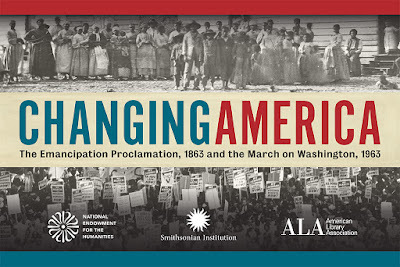 Changing America: The Emancipation Proclamation, 1863, and the March on Washington, 1963 is presented by the Smithsonian’s National Museum of African American History and Culture and the National Museum of American History in collaboration with the American Library Association Public Programs Office. The exhibition is made possible by the National Endowment for the Humanities (NEH) and is part of NEH’s Bridging Cultures initiative, “Created Equal: America’s Civil Rights Struggle” (see http://createdequal.neh.gov). In connection with the Changing America exhibition, Whitworth University, Gonzaga University and Eastern Washington University are contributing materials to a local exhibit from the same time period featuring pieces from library archives. In addition, Whitworth will host two free public events to discuss the historical movements and the context behind them. On Tuesday, April 12, at 7 p.m., a Changing America panel will present and facilitate discussion, featuring participation from Gonzaga Associate Academic Vice President and Professor of Religious Studies Ron Large, Ph.D., Whitworth Associate Vice President for Diversity, Equity and Inclusion and Assistant Professor of History Lawrence A. Q. Burnley, Ph.D., and Whitworth Associate Dean of Graduate Studies in Education Roberta Wilburn, Ed.D., Th.D. The panel’s topics will include the March on Washington through the lens of Rev. Martin Luther King, Jr.’s “I Have a Dream” speech, Abraham Lincoln and American democracy at the time of the Emancipation Proclamation, and more. On Thursday, May 5, University of Washington Professor Emeritus and Professor of American History Quintard Taylor, Ph.D., will share at Whitworth his expertise in African American history in the American West. For more information on either event, please call (509) 777-4488 or email kwatts@whitworth.edu. Changing America will be on display at the library until May 20. The National Museum of African American History and Culture was established as a Smithsonian museum by an Act of Congress in 2003. It is the only national museum devoted exclusively to the documentation of African American life, art, history and culture. Groundbreaking for the $500 million museum took place in February 2013 in a ceremony featuring remarks by President Barack Obama; former First Lady Laura Bush, a member of the museum’s advisory council; and Rep. John Lewis (D-Ga.), who submitted the legislation that created the project. The museum is now under construction on Washington’s National Mall, on a five-acre site adjacent to the Washington Monument. It is scheduled to open this fall. For more information, visit www.nmaahc.si.edu. Created in 1965 as an independent federal agency, the National Endowment for the Humanities supports learning in history, literature, philosophy and other areas of the humanities. NEH grants enrich classroom learning, create and preserve knowledge, and bring ideas to life through public television, radio, new technologies, exhibitions and programs in libraries, museums and other community places. Additional information about the National Endowment for the Humanities and its grant programs is available at www.neh.gov. Kathy Watts, access services librarian, Whitworth University, (509) 777-4488 or kwatts@whitworth.edu.